Volkswagen is joining the pint-sized EV crowd with an electric version of its up! city car. This enthusiastically named EV will make its public debut at the Frankfurt Motor Show in September. Like the regular up!, the electric version (reportedly called e-up!) will be available as either a three- or five-door hatchback. External changes are expected to be subtle (no chrome Ford Focus grilles here), so the up! will go about its business without attracting too much attention to itself. At 2,048 pounds, the up! is fairly light compared to most new cars. With the gasoline engine gone, the 400-pound electric drivetrain will still make up a significant portion of that weight. It consists of an electric motor where the gasoline engine used to reside, and a lithium-ion battery pack under the rear seat. The motor will produce 82 horsepower, which should be enough to get the e-up! from 0 to 62 mph (0-100 kph) in about 13 seconds, and on to a top speed of 80 mph. That may not sound like much, but the e-up!’s potential competition can’t do much better. A Scion iQ EV (or Toyota eQ, if you’re in Europe) can only go 77 mph, and a conventional up! with the available 1.0-liter, 74 hp three-cylinder gasoline engine takes 13.2 seconds to reach 60 mph. On the range and charging front, the e-up! looks much more impressive. Range is reportedly 80 miles, which beats the Scion (52 miles) and the Mitsubishi i-MiEV (62 miles) handily. The e-up! will have the same range as a Nissan Leaf, an impressive feat considering that the e-up! will probably have a smaller battery pack to fit its smaller chassis. Volkswagen says the e-up! can be fully recharged from a household outlet in six hours, about the time it takes to charge most EVs from a fast Level 2 charger. And if buyers do use a quick charger? It will take just 40 minutes. We’ll have to wait for the e-up!’s Frankfurt debut to verify that number, which would give the e-up! the fastest full recharge time of any EV. No official pricing for the e-up! has been released, although Volkswagen apparently plans to sell the cars to consumers, but have them lease the battery packs. This would lessen concerns over battery pack reliability, since the packs wouldn’t have to last the life of a car. With a Frankfurt Motor Show launch scheduled for September, the e-up! could be in European showrooms by the end of the year. However, it probably won’t make it to the United States. 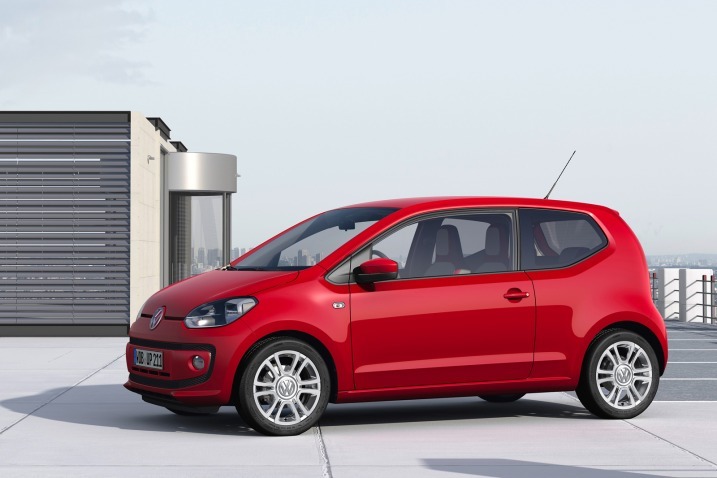 Volkswagen has no official plans to import the e-up!, and since the regular up! isn;t sold here, that makes sense. Any smart dealer knows that Americans have an aversion to tiny city cars, and we already have small batches of iQ EVs, iMiEVs, and the Fiat 500e to play with.